I used to - I’m not saying it’s never going to happen again - run a half marathon the same day as the RnRLV Half Marathon. For the past couple of years, I’ve spent the entire weekend in Las Vegas with best running friends (BRFs) and it’s still been a blast. This year was certainly no exception. I always consider myself a very lucky person in that I am able to get away to Vegas to run with friends. As much as I’d love Paula to come out, it’s still very challenging to fly with the entire family, no matter how short the distance or length of stay. 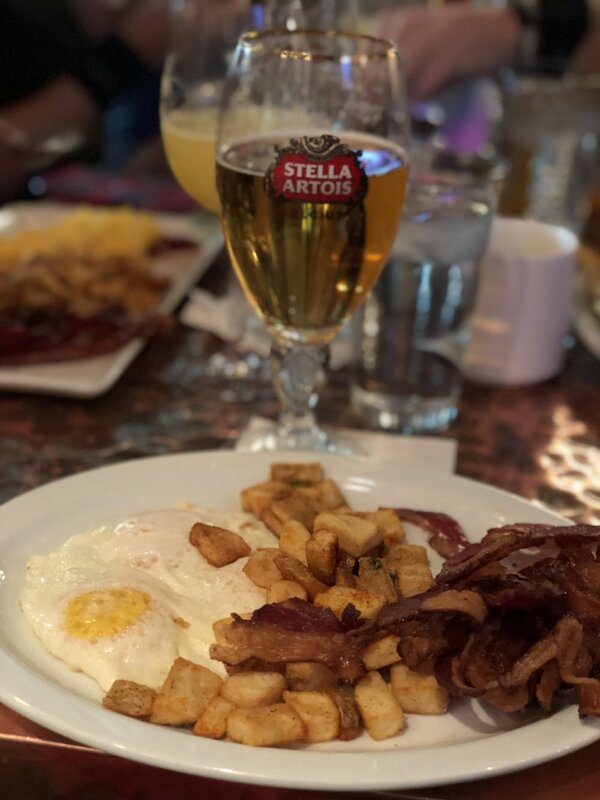 I got in to Vegas on Saturday morning and connected with friends for brunch after they finished a quick shakeout run that morning. I quickly hit up the expo and took the monorail down to the City Center. If you’ve never been to Vegas, just know that the blocks and casinos are huge and you’ll do a lot of walking even with a monorail shuttling you up and down the Strip. Brunch was delish and I couldn’t pass up the opportunity to get a drink with my soon to be ex-pat buddy, Dani, before she leaves for Amsterdam in a couple months. Seeing Kat and Gary made our day. Happy Bday to their little one!! The group split up and we had plenty of time to do a little shopping before we got ready for the 5k that evening. While we didn’t find the deal at the Lululemon outlet like we did last year (no $25 shorts this time), we still got a chance to hang and chill. #Flatrunner for 5k: ProCompression, Lululemon, Garmin, Brooks and WeRunSocial. A little RWB for Veteran's Day. As usual, there’s a @WeRunSocial pre-race meet up before the 5k which is held out at the Las Vegas Fairgrounds next to the SLS hotel. We actually almost didn’t make it to the meet up since the monorail to the 5k area was such a hot mess and once we got there the security was extremely tight. There are just so many people trying to get to one place and the capacity on the monorail trains isn’t that high. I’m not sure how they could remedy this but I guess it beats spending money on a cab or walking. This year, instead of full-on Donuts, there were donut holes which were perfect bites for everyone to enjoy while we waited for the race to start. The race itself is run as an out and back on a very dark road. We ran with a good group and picked up more cool glowing light sticks along the way. If you recall, at last year’s 5k, both Brian (@pavementrunner) and I both raced to “beat the sign” but were unsuccessful. You see, Carlee (@carleemcdot) dressed up as the “Welcome to Las Vegas” sign. Well this year’s theme was “beat the wig” because she came dressed up in full on Elvis attire with a souped up wig to complete the look. There was a tie. So we officially didn't "Beat the Wig"
We had such a blast running and we stayed a bit to listen to the Headliner which was moved to Saturday night because of the change in Start Venue of the Half Marathon the next day. Due to the horrible event that took place last month, the Rock ’n’ Roll staff decided to move things around a bit which included the start line of the Half Marathon and this included the usual pre-race concert. Nonetheless, the crowd was just as excited to see the concert and enjoy their Saturday night. Sunday we had plenty of time to chill, relax and SLEEP IN! So many miles are put on your feet out there in Vegas. Once we were able to get coffee and something to eat, Brian and I headed out to do a little shopping. Do you get the theme here? We heard that the local Lululemon shops were heat pressing special edition graphics for the race weekend in support of the tragic event last month and also to celebrate the races that weekend. We grabbed a couple limited edition items and felt totally redeemed from the lame shopping experience from Saturday. Reflective running gear. Because VEGAS! After grabbing a quick bite and getting dressed we headed out towards the Start line area. Here at the Half Marathon, there weren't bag checks, or metal wands. There were Las Vegas police and sheriffs patrolling the area though. We just thought it was a bit strange. It's @pinkcupcakegirl and @steph1583. They look amazing after just running Disney Super Heroes Half that morning! Best suits on the Strip! The meet up was fun and Brian handed out a bunch of #WeRunSocial multi-use “thingys” and that got the mood started off right. Who doesn’t like free running stuff? There were a bunch of folks who had just came in from running the Disneyland Super Heroes Half marathon weekend events including our two other deck of cards suits, Richard @Blingwhore and Niles @Nilesdvu. One of the highlights (no pun intended) of the weekend was coordinating race outfits with these guys. Let’s say the theme of the night was wearing reflective gear. From visors down to shoes, we definitely lit up the Strip (scroll down to see how)! After saying excuse me a million times and fighting our way to the front of the corral, we set up to run/walk/jog/PARTY for 13.1 miles! We don’t run this course for time. As a matter of fact, one of the group actually wanted to run the half marathon OVER three hours! I’m sure we could make that happen. While running down the Strip, we noticed that we were running together as a group of 10. This is no easy feat as there are thousands of other runners on the course. We communicated extremely well with each other and even gave ourselves numbers to count off so we wouldn’t lose anyone. This turned out to be a wonderful idea and we got quite a few looks as we counted off randomly if we felt like we were losing anyone. I was #8 if you were wondering. We had to show the @ProCompression sock in the blacklight! So cool! with Kylo Ren. Had to. Last year, we stopped for $3 beers at mile 12 and this year we vowed to get them earlier in the race. We made our first beer stop at mile 5.5 and ran/walked as we downed the drinks. We even met a couple that got married that day and shared a drink with them. How fitting. They were even dressed up as bride and groom. Only in Vegas. Traditions. It's a THING! Its eerie how similar this is to last year's pic. We hit mile 12 and another beer stop (same as last year). By this point, my GoPro had died and we relied on Richard’s to capture the pics. 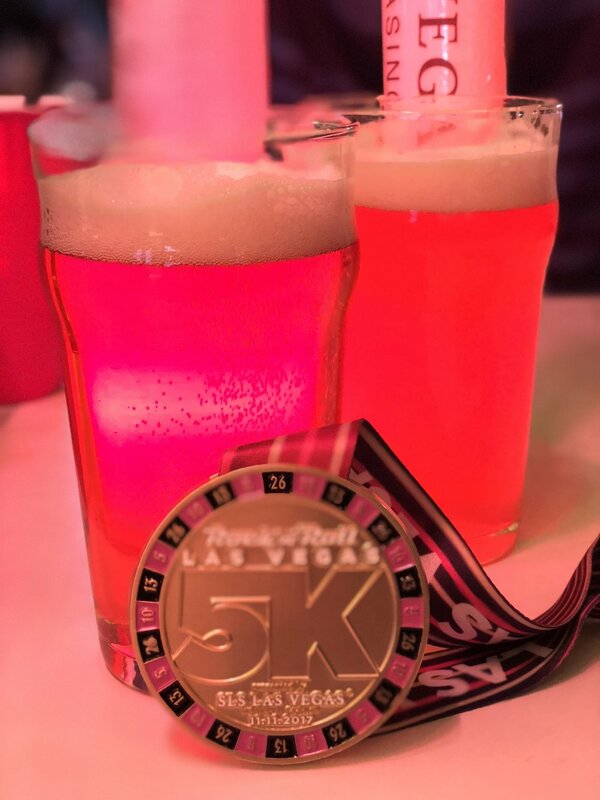 We ran across the finish line with beers in hand and celebrated our 3+ hour trek along the Las Vegas Strip! I love this weekend as it signifies the end to another year of running. You can call it your victory lap for all of the hard work and training you put in during the year. This is my 4th year running Vegas and I will always say, take the chance to run this race if you can. 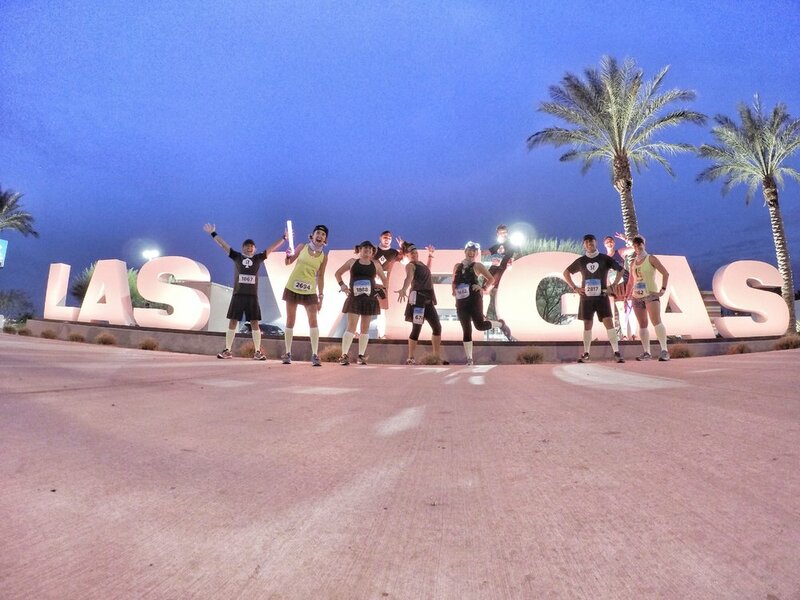 The Strip never closes down like this and it’s truly a unique running experience that you’ll never forget.